Whose Crimea is it anyway? On 18 March, Vladimir Putin declared to the Russian parliament that Crimea had always been an inseparable part of Russia. But in fact the peninsula’s history is not so simple. Putin’s speech marked the culmination of Russia’s efforts to annex Crimea and outlined the historical basis for the move. In a fervent nationalist appeal, Putin dismissed the transfer of Crimea from Soviet Russia to Soviet Ukraine in 1954 as the whim of a totalitarian ruler, with tragic consequences for the peninsula’s ethnic Russians. But Khrushchev’s decision to place Crimea under Ukrainian administration was a calculated one – the area’s strong economic and administrative ties to Ukraine were crucial for its postwar reconstruction. Moreover, although Crimea had become part of Russia in the late 18th century, it was only in Soviet Ukraine that it acquired the Russian identity that Putin is tapping into today. Khrushchev’s decision to place Crimea under Ukrainian administration was a calculated one. Putin claimed the transfer of Crimea to Ukraine in 1954 was a mere formality. Before the collapse of the USSR, he suggested, the Ukrainian administration had no impact on Crimea’s political and cultural identity: ‘It was only when Crimea suddenly ended up in a different country [in 1991] that Russia realised it had not been simply robbed, but plundered.’ This view is, however, founded on a basic misunderstanding of the USSR’s political structure. The Soviet Union was divided into fifteen ethnically designated republics, and although Moscow had the deciding voice in most matters, the republics had their own governments, budgets and communist parties. Sevastopol devastated by German bombardment. Crimea suffered greatly from the war. via German Federal Archive.This federal structure distinguished the USSR from the old Tsarist Empire: contrary to popular perceptions, the leaders of each republic retained a significant degree of cultural and linguistic autonomy, and were able to promote non-Russians to administrative and political posts. At the same time, xenophobia was rampant in the USSR after the mid-1930s. Claiming that all ethnicities had the right to political representation, Moscow in fact declared ethnic Russians as ‘first among equals’ and targeted entire ethnic groups for repressions and deportations. In Ukraine, this created tensions between Ukrainians and Russians, as members of both ethnic groups made claims to political leadership in the republic. Whether Crimea belonged to Soviet Russia or Soviet Ukraine was not without significance. Crimea was integrated into the Ukrainian political and administrative system in 1954. To be sure, the transfer of Crimea was an unsettling experience for the local elite. Party apparatchiks, collective farm chairmen and factory directors suddenly faced a barrage of letters from Kyiv, sometimes in the unfamiliar Ukrainian language, calling for substantial restructuring of the local economy. But while local cadres were indeed in flux (as was the case throughout the USSR in the 1950s), leaders in Kyiv were reluctant to replace the predominantly Russian elite of Crimea with ethnic Ukrainians. Ultimately, the legitimacy of Ukrainian rule in Soviet Crimea was grounded in Kyiv’s ability to fix the economy. Soon, the Crimean elites were looking to Kyiv for funding and advice. Although Putin asserts that Crimea was always close to ‘Russian hearts and minds,’ the peninsula had been neglected in Soviet Russia before 1954. Badly damaged during the Second World War, it was still in a sorry state when it joined Ukraine: hospitals destroyed during the war had not been rebuilt; water shortages plagued collective farms and major towns such as Sevastopol and Simferopol, while the beaches of Yalta were covered in excrement for the want of sewage systems on the Crimean coast. In short, government institutions in Soviet Russia had little time for Crimea. 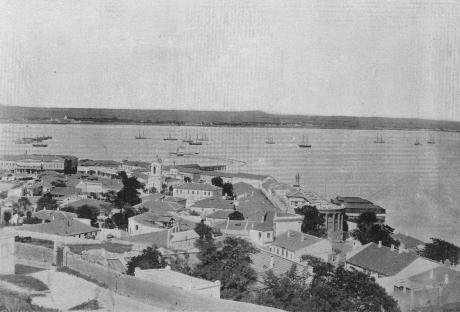 The Crimean town of Kerch in 1902. Post-war Crimea was very different from the Crimea of Imperial Russia. CC G. N. KarantaBut while the Russian authorities, for example, shirked responsibility for restoring Crimean park spaces that had played a crucial role in Tsarist-era natural sciences, Ukraine was keen to invest in their development. ‘The botanical gardens near Yalta should be turned into a leading research institution for southern Ukraine,’ argued scientists in Kyiv. Keen to redefine the cultural map of Soviet Ukraine, Kyiv also opened up new opportunities for Crimean artists and writers. For example, partly in order to appease the Soviet Ukrainian intelligentsia that called for increased cultural autonomy after the death of Stalin, the Ukrainian Government sponsored Ukrainian translations of Russian-language works by Crimean authors. Ultimately, however, the legitimacy of Ukrainian rule in Soviet Crimea was grounded in Kyiv’s ability to fix the economy. Immediately after the transfer, agricultural specialists from Kyiv travelled south to revitalise ailing vineyards and orchards that had been neglected since before the Second World War. Between 1954 and 1958, Kyiv planned to increase the number of hospital beds in Crimea from 1600 to 2200. The money would come mostly from the Ukrainian budget, with the Soviet central government covering some 38% of the cost. But the locals were not always thrilled to be integrated into Ukraine’s economy. Rumours spread in the 1950s that Kyiv would lower local salaries and replace regional leaders with its own people. Just as in 2014, many Crimeans in the 1950s perceived Ukraine as Russia’s poor cousin and believed that they would be better off under Russian rule. 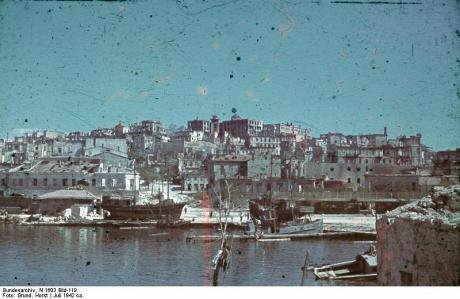 The rebuilding of Crimea in the 1950s was not just a question of better management and money. Kyiv also needed to establish a new culture for the peninsula. This is not to suggest that Crimea was a cultural wasteland in 1954 – the peninsula had its own radio, newspapers, and three Russian-language theatres. Still, Ukrainian leaders had their hands full as Crimean culture had never completely recovered after the war. The museum at the Vorontsov Palace in Alupka, where Winston Churchill stayed during the Yalta conference in 1945, hadn’t reopened its doors after the war. The Sevastopol art gallery had a full rota of staff but no building in which to display its collections. As fear of crime grew in the early 1950s, there was little to bind Crimean society together. The brutal deportation of Crimean Tatars in 1944 had destroyed social networks (the Crimean Tatar movement for the right to return was one of the most sustained forms of dissent in the USSR, but they were not allowed back until the late 1980s). Meanwhile, settlers unfamiliar with each other and the local environment, arrived fast. As in other parts of the USSR, after the war and the death of Stalin, Soviet leaders were desperate to prevent social disintegration in Crimea. Nikita Khrushchev used Crimea to change the ethnic make-up of Ukraine and thereby undermine western Ukrainian nationalism. Culturally, Crimea was a bad fit in Soviet Ukraine. In 1954 ethnic Russians made up 75% of its population and the Ukrainian language was hardly spoken at all. In fact, as the Harvard historian Mark Kramer argues, Nikita Khrushchev used Crimea to change the ethnic make-up of Ukraine and thereby undermine the Ukrainian nationalism that plagued the USSR’s western borderlands after the Second World War. 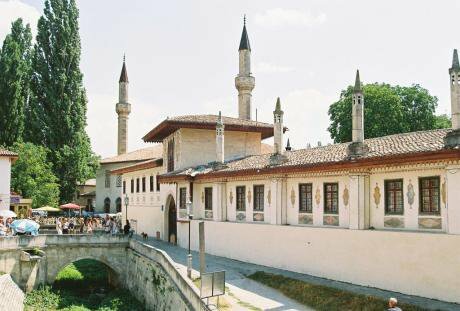 Kyiv made only very cautious attempts to bring Ukrainian culture to Crimea. A Ukrainian theatre opened in Simferopol, and Ukrainian-language newspapers were flown in from Kyiv every morning for Crimea’s ethnic Ukrainians; and a Ukrainian-language school opened in Simferopol in 1957 to accommodate newly arrived ethnic Ukrainians. 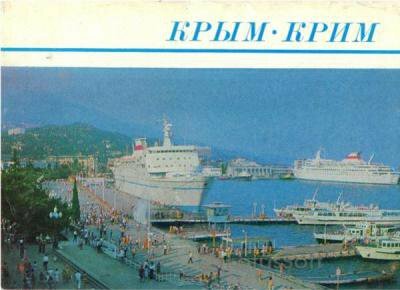 1970s Soviet postcard from Crimea in Russian and Ukrainian. Local post-war identity was pan-Slavic and anti-Western.Even these modest measures evoked some indignation among local inhabitants. Foreshadowing the concerns that many Crimeans have voiced in 2014, some locals in the 1950s feared they would now have to send their children to Ukrainian-language schools. ‘Why don’t we have a referendum to decide whether Crimea should belong to Russia or Ukraine?’, asked a resident in an anonymous note passed on to a local Communist Party apparatchik. The locals felt out of place in Ukraine. But the culture that emerged in Crimea in the 1950s was not purely Russian. To define what it meant to be Crimean, Ukrainian leaders promoted a peculiar form of East Slavic identity grounded in imperial Russian history. Official propaganda celebrated the transfer of Crimea as a manifestation of Russo-Ukrainian brotherhood dating back to the medieval kingdom of Rus. Today, the same historical tropes are used to justify Crimea’s transfer in the other direction. Russian politicians today deliberately obscure Crimea’s economic and administrative links to Ukraine. The Khans' Palace at Bakhchisaray, which stood as a monument to Russian resistance during the Soviet period. CC ChapultepecCrimean identity politics in the 1950s was in fact underpinned by a strong degree of xenophobia. Local leaders even suggested changing the Tatar names of villages, rivers, and mountains that sounded odd to the Russian and Ukrainian ear. The Slavonic identity of Crimea was also distinctly anti-Western. Ukrainian actors and writers from Kyiv travelled to the peninsula to celebrate East Slavonic efforts to protect Crimea from the British, French and Germans, conflating the siege of Sevastopol during the Crimean War of the 1850s with the Nazi occupation of the 1940s. As Putin lays claim to this Ukrainian territory, he veers between ethnic and multi-ethnic visions of the ‘Russian World.’ Vowing to protect ethnic Russians and Russian speakers in the near abroad, he also celebrates supposedly peaceful inter-ethnic relations in the Russian Federation. Notwithstanding the impassioned rhetoric, it is crucial to remember that modern-day Crimea and the many historical narratives that surround it are largely a product of the 1950s. To justify their annexation of Crimea, Russian politicians deliberately obscure its economic and administrative links to Ukraine, that could form the basis of a cohesive civic identity on the peninsula. They draw instead on the Soviet myths of Slavic brotherhood that allowed the cultivation of separate Russian and Ukrainian national identities in the USSR, but were also used to foster anti-Western sentiment, and to exclude non-Slavs from the imagined Crimean community. Russian multiculturalism in Crimea and elsewhere is grounded in imperial Russian history and the Soviet concept of ethnic Russians as the ‘first among equals.’ As a result, Crimea today risks becoming once more a neglected province of the Russian Federation divided along ethnic lines.